Coffee, walnuts and chocolate - they have a way of worming their way into my baking wish list! 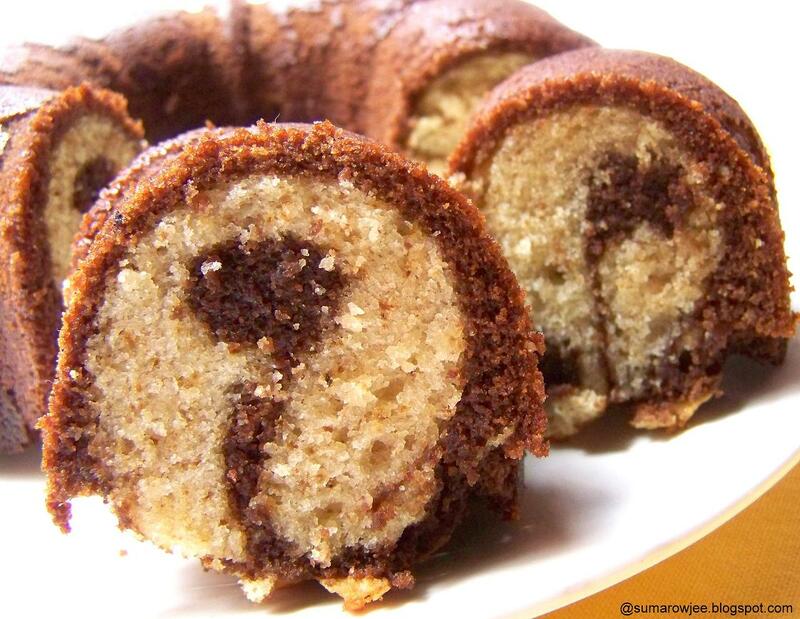 The trio in a marbled bundt cake - irresistible! Flip through Dorie Greenspan's Baking - From My Home To Yours and this cake is sure to charm you into baking it! A rich batter of dark chocolate, ground walnuts and coffee swirled through a vanilla walnut batter. A drizzle of chocolate sauce over the slice adds to the charm. A slightly but pleasantly dense cake with a fine crumb . The chocolate and coffee part, if you ask me, was even better! I have to admit, I am not always lucky marbling cakes. Turns out Lady luck was on my side this time around, may be I can marble cakes after all! One way of doing this is placing alternate spoonfuls of batter in the pan and then running a skewer through it to give a more marbled effect. First spooning all of the batter of one color into the bundt, then the other batter on top, then swirl will give a ginkgo pattern. Amazing! With marbled cakes, you will hold your breath till you cut the cake and see what pattern has emerged - its never the same! Amazing! 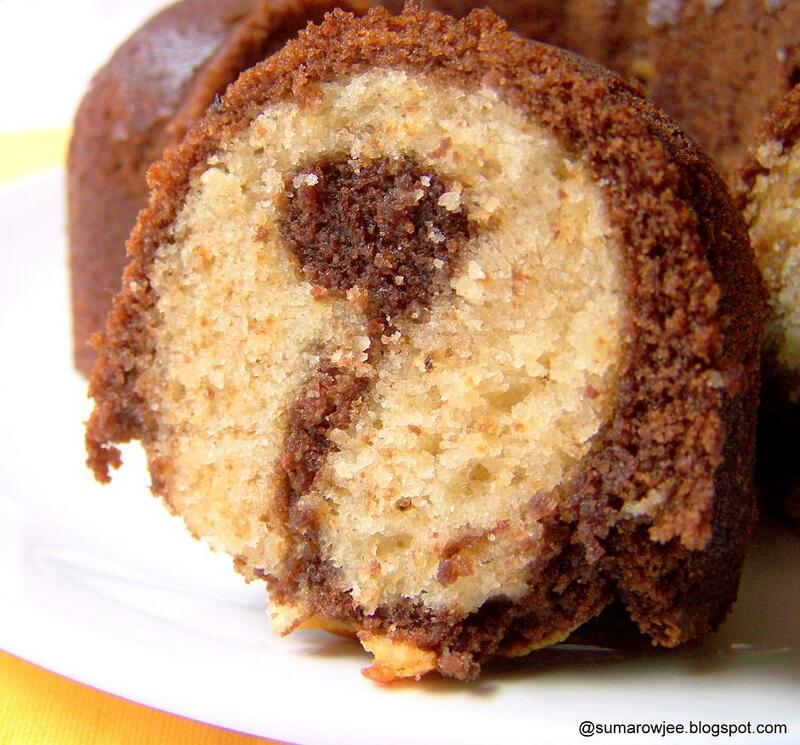 Mocha Walnut Bundt Cake , From Dorie Greenspan's 'Baking - From My Home To Yours'. I have halved the original recipe and baked in my small 6 cup bundt pan. GETTING READY: Center a rack in the oven and preheat the oven to 180 degrees C / 350°F. Grease a 9 - to 10-inch (12-cup) Bundt pan with special attention to the nooks and crannies, dust the inside with flour and tap out the excess. (If you’ve got a silicone Bundt pan, there’s no need to butter or flour it.) 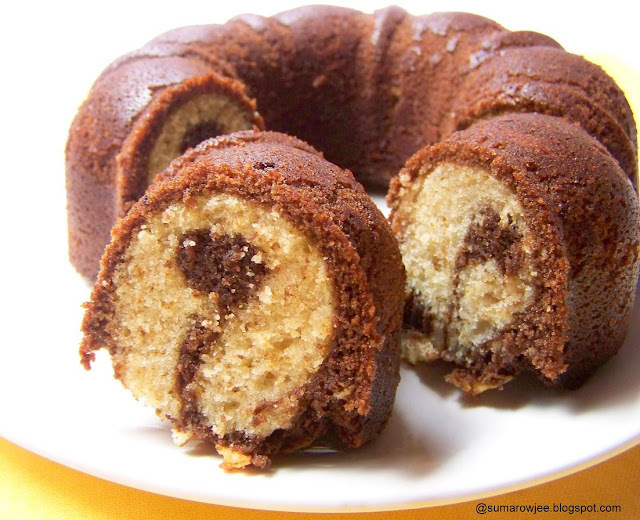 Don’t place the pan on a baking sheet – you want the oven’s heat to circulate through the Bundt’s inner tube. Sift together the flour, ground walnuts, baking powder, and salt. I do this twice. Set aside. Break the eggs and put them in a bowl, whisk lightly, weigh, set aside. Have another medium sized, clean and dry bowl ready. You will be mixing the chocolate batter in this. An extra spatula and a thin long skewer to swirl the batter. Working with a stand mixer, preferably with a paddle attachment or with a hand mixer in a large bowl ( I used my hand mixer, speed 2), beat the remaining 2 sticks / 1 cup of butter and the sugar at medium speed for about 3 minutes – you’ll have a thick paste; this won’t be light and fluffy. Beat in the eggs one by one, beating well after each addition. The mixture should look smooth and satiny. Beat in the vanilla extract. Reduce the mixer speed to low and add the dry ingredients and the milk alternately, adding the dry mixture in 3 portions and the milk in 2 (begin and end with the dry ingredients). If you want to go for the gingko pattern, scrape all of the white batter into the pan and top with the chocolate ( I have put the chocolate first). If you want a more marbled pattern, alternate spoonfuls of light and dark batter in the pan. When all the batter is in the pan, swirl a table knife sparingly through the batters to marble them. Bake for 60 to 70 minutes ( I baked the small cake for 50 minutes), or until a thin skewer inserted deep into the center of the cake comes out clean and the vanilla part is a nice golden brown. Transfer the Bundt pan to a rack and let cool for 10 minutes before unmolding ( I use a plastic knife), then cool the cake completely on the rack. I play safe, cool for almost 1/2 to 1 hour. Flour - Dorie measures flour using the dip and sweep method, which weighs 140 grams /5 oz per cup. Walnuts - I have first ground chopped walnuts and then measured. I have then ground it with some of the flour in the smallest jar of my mixer before proceeding. Butter - To get the butter to room temperature, take it out of the fridge, weigh and cut into cubes and keep it on your counter. The butter should not be too soft or oily - it should be pliable but still cool to the touch, that's when its ready to use says Dorie. Microwaving the butter in short spurts is fine, but tricky, a second too much and the butter will be too soft, so I avoid this. I am going to be taking a short break from blogging - just stealing time for myself! A few of my blogger friends have been kind enough to guest-post for me during this period. So stay tuned for some fabulous treats coming up! Please do visit my space, leave your much awaited comments or drop me a line at suma dot rowjee at gmail dot com for any queries or just to say hello! Would love to hear from you! I look at the recipe and the picture on BFMHTY every time I open the book and drool.yet to bake it myself.Love the neat slices and the marble pattern! Enjoy your break and have fun! Marbling is very nice.. could see the two different colors easily.. Enjoy your break and come back with more!!! What a cake man...FANTASTIC!!! Rest of the viewers..(ducking to avoid stones)...got a chance to taste this wonderful piece of cake...phew...tooo good! Wowwwwwwwwww..... Whatta cake!!! And what lovely pattern you've got!! Just loved it! very delicious cake suma...enjoy ur break dear!!! 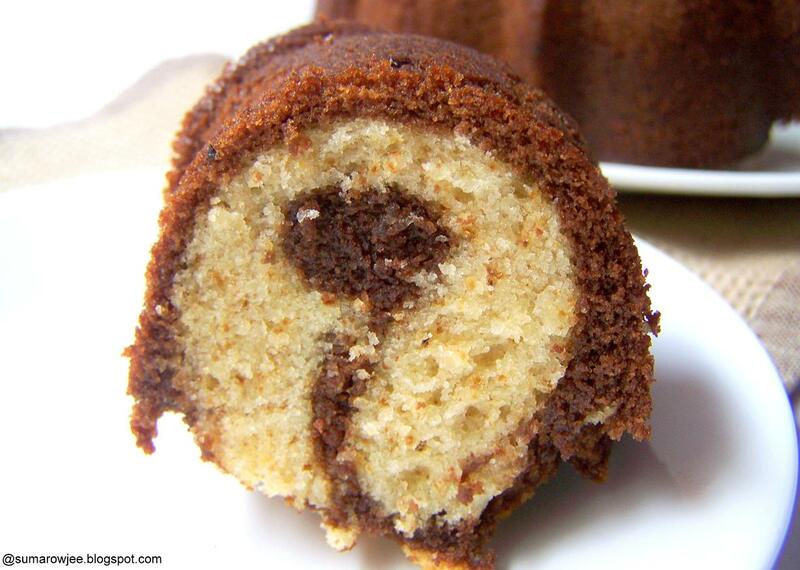 Wow wat an ultimate combo,fantastic and prefect looking bundt cake.